It was a hugely successful voyage of discovery; an intimate peek at an awesome, beautiful, yet forbidding world; a mini solar system in our own celestial backyard. From nearly half a billion miles away, the breathtakingly spectacular color photos of Jupiter and its moons provided new insights — and raised some puzzling questions — about a giant planet that, at 1,300 times the volume of Earth, is almost another star. Voyager I, launched from Cape Canaveral in September 1977, journeyed for 18 months and 400 million miles before threading its way past Jupiter and its 13 known moons. At one point the 1,800-pound spacecraft came within 173,000 miles of the solar system's largest planet. Equipped with eleven different scientific instruments plus special cameras, Voyager found Jupiter to be sizzling with powerful radiation and covered with colorful and violently turbulent clouds. Over a dozen orange and white bands were seen rotating in the ever-changing atmosphere. The famed Great Red Spot — several times the size of Earth — was revealed as a gigantic swirling pattern of deep orange clouds with long braided flows in shades of tan and amber streaming away from colossal pinwheellike spirals and vortices. The Red Spot, first discovered some 300 years ago, appears to be a "permanent hurricane." Indeed, there are many storms on Jupiter with lifetimes so great that by Earth standards they defy the imagination. GIANT PLANET JUPITER (left) and two of its moons, Io and Europa, were photographed by Voyager I from 12 million miles away. Io is seen passing over Jupiter's Great Red Spot. Close-up of turbulent Great Red Spot (lower left), colorful scarred surface of Io (lower center), and the Moon-like appearance of the Jovian satellite Ganymede show the awesome and forbidding worlds revealed by the Voyager mission. — See PDF for Pictures. theories about the formation of the solar system may have to be extensively revised. Speeding along at up to 84,000 miles per hour , Voyager also photographed the surfaces of the moons Ganymede, Europa and Callisto, the remaining Galilean moons. Callisto, darkest and outmost of the Galilean satellites, has a gigantic circular basin rimmed with wavelike ridges. Europa seems to have an ice crust. Voyager photos of Ganymede showed a desert-like floor crisscrossed by faults or valleys that look like marks made by dune buggies. One of the greatest surprises of the Voyager probe was the discovery of a flat thin ring of particles around the equator of Jupiter. When only Saturn was known to have such a ring system, astronomers often considered its formation to be a fluke. But in March 1977, Uranus was also found to have a ring. And now, Jupiter. With three planets known to have bracelets of extraplanetary material around them, scientists are being forced to come up with a reasonable explanation. The "fluke hypothesis" no longer seems viable. Voyager I is now headed for a close-up look at Saturn, its rings and its moons. But Saturn is about twice the distance of Jupiter from the sun and the spacecraft will not arrive until November 1980. Meanwhile, another probe, Voyager II, will arrive at Jupiter in July of this year, on the tenth anniversary of Apollo 11 . 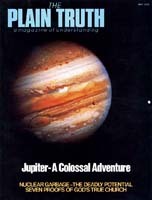 The unprecedented Voyager exploration of Jupiter, Saturn and other distant planets will provide new understanding of man's place in the universe; at the same time, the stark desolation and hostile conditions on these alien worlds should serve to remind us of our unique and precious home on planet Earth.